Michael Wolgemut was a painter and an important German printmaker of the late 15th and early 16th centuries. In Munich he worked with artists of the stature of Gabriel Mälesskircher, while Albrecht Dürer was one of his pupils. 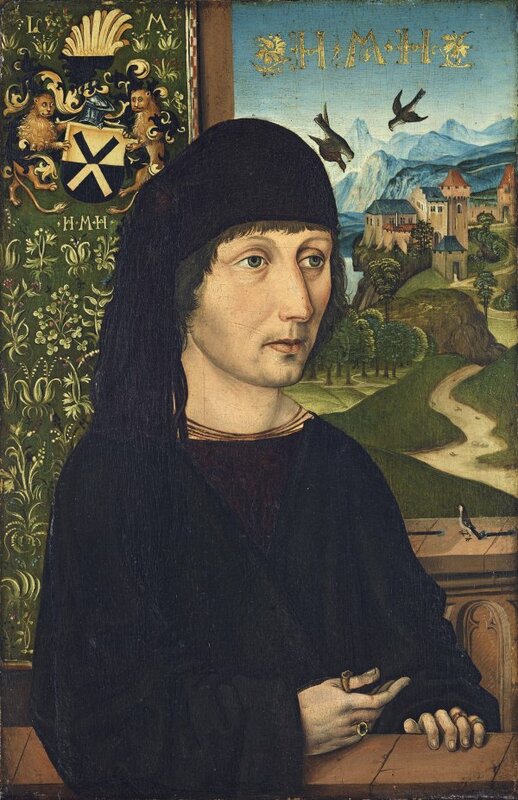 His early works reveal the influence of Rogier van der Weyden, Dieric Bouts and Aelbert van Ouwater. Later, and particularly in his graphic work, the influence of Martin Schongauer becomes apparent. Wolgemut’s style is characterised by the importance given to line and the austere treatment of the figures, with colour reserved for the landscape backgrounds. 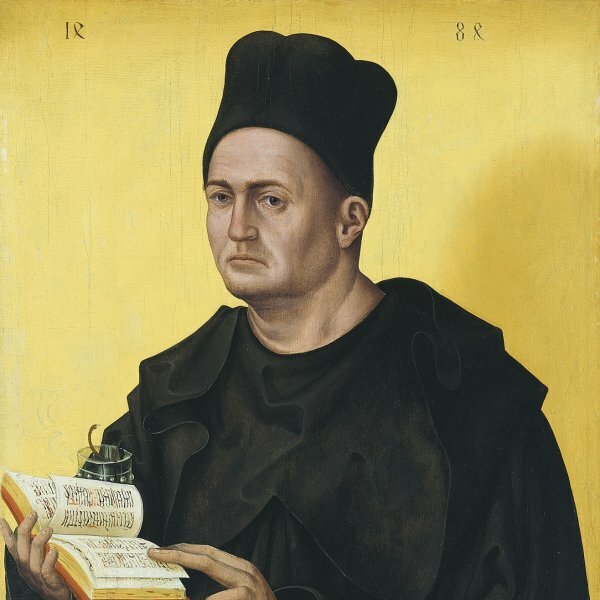 The sitter in the present work has been identified as Levinus Memminger on the basis of a comparison with the interior left wing of the Saint Catherine Altar in the Lorenzkirche in Nuremberg, commissioned by Memminger in honour of his wife’s patron saint. The similarity between the figures is obvious, both with regard to the position of the face in profile and the arrangement of the hands and fall of the drapery. In the present panel, Wolgemut locates the sitter in a sort of balcony before a landscape receding into the far background. On the left is a tapestry with Memminger’s coat-of-arms and the initials of his name, which also appear in the sky. This small portrait entered the Thyssen-Bornemisza collection in 1934, having previously been in the Sala collection in Paris until 1933. Prior to that it was in a private US collection. 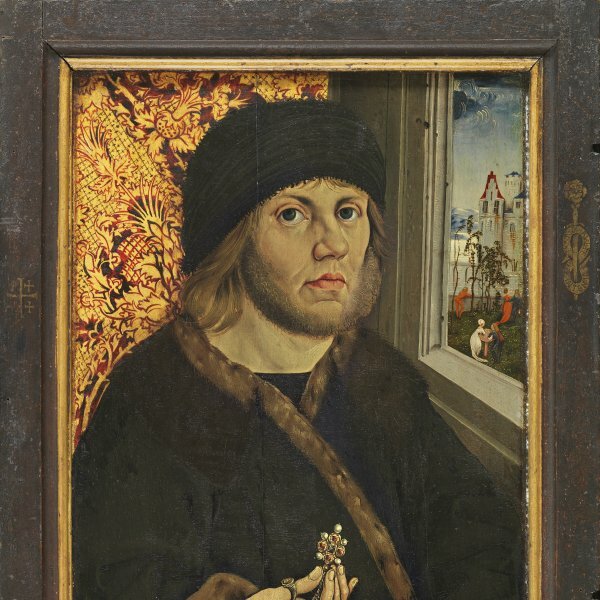 Two years before the panel entered the Thyssen-Bornemisza collection, Wenke attributed it to Michael Wolgemut and identified the sitter. The painting had previously been studied by Ernst Buchner in 1927, who attributed it to an anonymous artist with the initials W.B. Wenke related the sitter to a figure on the left wing of the Saint Catherine Altarpiece in the Lorenzkirche in Nuremberg. This altar, whose central section contains sculptures, has two closing wings. On the inside face of the left wing the present sitter is to be seen with a halo and a cockerel, represented as Saint Guido and forming part of the group of figures that surround the principal motif of The Mystic Marriage of Saint Catherine. The right wing has a depiction of The Identification of the True Cross. The altar was commissioned around 1485 by Levinus Memminger, a date that is relevant to the present panel due to the similarity of style between the two images. The present portrait may have been painted just afterwards or at the same time as the altar. The oratory of the church of Saint Lawrence was dedicated to Saint Catherine, the patron saint of Memminger’s wife. The similarity between the two depictions of Memminger is evident in the disposition of the face and the three-quarter profile. There are, however, differences in the placement of the hands, the clothes and the background. Wolgemut located the sitter on a narrow terrace and used the parapet as a support for the hands. The setting, as Lübbeke noted, is unusual in the emphasis placed on the landscape at this early date. The background also includes a tapestry in whose upper part we see a coat-of-arms, above which are the sitter’s initials, l.m., in capital letters. In addition, there is another set of initials, h.m.h. below, which are repeated in the sky above the landscape. It has been suggested that these refer to a motto of some sort. Levinus Memminger is precisely depicted using a sober range of colours characteristic of the artist. This austerity contrasts with the imaginary landscape, which is painted in a limited but bright range of tones. The falcons in the sky, one of which has caught a bird, were interpreted by Buchner in a reading that has not generally been accepted. According to Lübbeke they may function as a memento mori. Wolgemut was Dürer’s teacher and was highly respected by his pupil, a sentiment evident in the painted portrait that Dürer made of him when Wolgemut was 82 and its accompanying inscription.